SpaceX: Bad strut doomed Falcon 9 rocket. 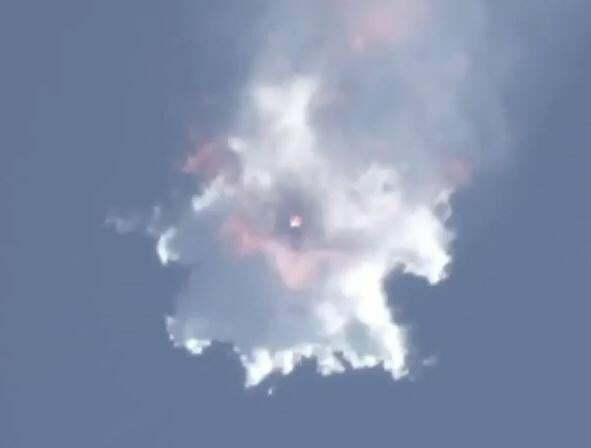 White vapor (probably liquid oxygen) blasts away from the Falcon 9 rocket after a strut snapped in the second stage, leading to a series of events that led to the loss of the vehicle. On June 28, 2015, disaster hit an uncrewed SpaceX Falcon 9 rocket 2 minutes 20 seconds after launch. Video made it clear something went wrong in the second stage, and at a press conference on Monday, CEO Elon Musk announced the most probable cause: a strut failure that led to the loss of the vehicle. As fuel is used up during launch, high-pressure helium is fed into the liquid oxygen tank to maintain the pressure in that tank. The helium is kept at 5,500 PSI inside a bottle. During launch, a strut holding the helium bottle down snapped. Counterintuitively, during the high acceleration of launch the helium tank feels a large force upward, because the helium in the tank is highly buoyant. The larger the acceleration is, the larger the buoyant force gets, and the more force the helium tank feels upwards. The strut that snapped was designed to hold the bottle down against this force. When it snapped, the helium tank shot upward, slamming into and rupturing the liquid oxygen tank. The super-cold oxygen then boiled, expanded rapidly, and breached the second stage walls. In the video, you can see that what happened was not technically an explosion; there’s no fireball, but you can see the expanding vapor from the oxygen tank flying away. These struts are certified before launch, but Musk has promised that they will do a second test individually on each strut from here on out; this will mean a slightly higher cost for each launch but not a significant one. This strut failure is hard to test for on the ground. As Musk pointed out, boosters are tested strapped down on the ground, so they only ever feel 1 g of acceleration (due to gravity). This failure happened when the rocket was undergoing 3.2 g, which cannot be realistically tested except in launch. This is a “really odd failure mode” and “quite a puzzle,” Musk said. The root cause of the failure still isn’t known; the strut failed at well under the rated stress level (it’s rated for 10,000 pounds of force, and failed at 2,000). They are continuing to look into the telemetry; this series of events is the preliminary conclusion of the failure, not the definitive one. Musk also said this will delay the next uncrewed flight (probably until September), and the loss of revenue to SpaceX will likely go into the hundreds of millions of dollars. Still, this probably won’t delay crewed flight, since that pace is being set by developing the next generation Dragon V2, which will likely take longer than fixing the strut issue. Speaking of which, the Dragon capsule (filled with supplies for the space station) on the Falcon 9 survived the initial event, and in fact they were getting telemetry from it until it dropped below the horizon, but it was certainly lost when it impacted the ocean at high speed. Every indication was that, had the software triggered the parachute deployment, Dragon would have survived its fall into the ocean. However, that software has not been used on this Dragon version; it is supposed to be first implemented on the Dragon V2. Given that the capsule could have been saved, the new software will now be used on the current generation of Dragon capsules. Incidentally, the next generation Falcon Heavy rocket demo flight has been delayed as SpaceX concentrates on the Falcon 9 issue. The Heavy demo will now probably occur in spring 2016. Happily, no other problems have been seen in the telemetry. They’ve had 20 successful launches in a row, which is excellent, but as Musk notes, “a passing grade for rocket launches is 100 percent … this is an important lesson and something we will take with us in the future”. This is a huge setback for SpaceX, but Musk asserts that the company is on it and working to fix it for future launches. I certainly hope so.